Very nice surprise on the stand Sbarro Espera with this evocation of the Porsche 904. Designed and built in record time, the Renner is powered by a 4-cylinder flat original Subaru, placed in the rear center position. 300 horses for just a ton, it promises great performance. Beside the cars of his students, Franco Sbarro still surprises with a 4-seater electric tricycle evoking the rickshaw of Southeast Asia.. The second prototype of the 2017-2018 Espera promotion, Miles, is inspired by the Mercedes Grand Prix, the silver arrows. Curiously, I only found rare photos on the net, not giving much information to apprehend this car. To be continued. Alongside the work of the students of the Espera school, Franco Sbarro exhibits his own creations in Geneva. This year, in addition to an evolution of the Alcador GTB, Franco Sbarro presented the 4x4+2, an all-terrain vehicle with a tormented and very controversial style, based on a first generation Posche Cayenne. But the plus of this car is the presence of two additional non-driven wheels that improve the crossing capabilities of this vehicle designed for extreme rallies. The 22 Espera students return to electricity with the Dilemme, four years after Sparta. This time it was about designing a 100% electric Formula 1. The choice of a closed cockpit is unusual on a Formula 1. The Dilemme was as usual conceived and built in record time: 12 weeks. It is presented at the 2018 Geneva Motor Show. The 2016-2017 promotion has just begun its first prototype, a hot-rod powered by a Jaguar V8. The 24 students (20 boys and 4 girls) have 65 days to design and build from A to Z the car that will be presented at the Geneva Motor Show 2017. A beautiful challenge and a unique experience. Espera cars tend to make us forget that Franco Sbarro continues to produce cars. This year in Geneva, he unveiled the Ginevra 2016, a roadster version of the Ferrari 550 Maranello, with classical style, but unexpected details : a drawer at the back and helmets integrated into the bodywork. Espera 2014-2015 is over. 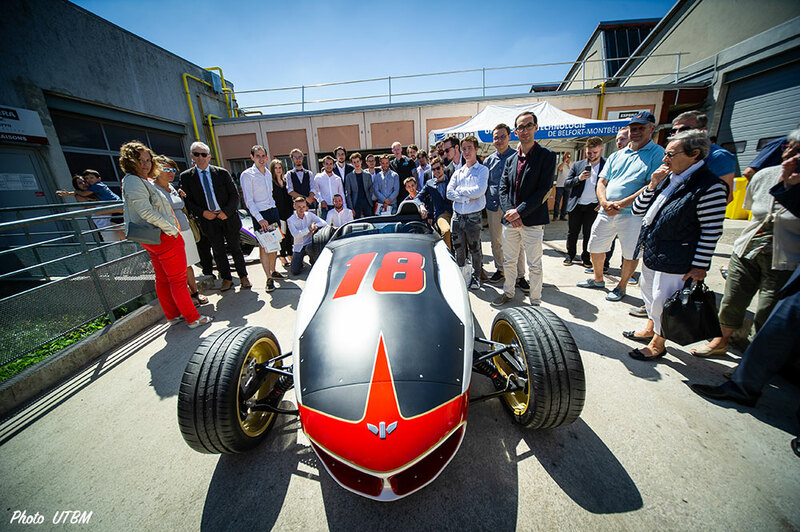 The 26 students showed their last prototype, Miglia, an evocation of Ferrari 60's, here beside Aria, unveiled in march at Geneva. Two fantastic cars, certainly the most beautiful cars created by Espera. Espera school organized few months ago a visit in the school workshop. Ammo published in his blog several photos of this exceptional day, with rare photos of the cars on the road. You can see this report at Ammoprod. Espera Sbarro Grand Prix is a beautiful concept that evokes the racing cars of the 30s, combining tradition (V12 engine, propulsion) and new in board technologies. You can discover this car on the Grand Prix page. For the second time, Espera and UTBM participated in the 2014 Rallye Monte Carlo Energies Nouvelles. In the wake of the Geneva Autoshow, Sparta was engaged in this rallye. Apart from some minor problems, Sparta and the team finished the rallye and were at the arrival. Don't forget Sparta is a prototype entirely conceived and constructed by students, in few weeks only, and engaged in these race without preparation. Félicitations ! All the pictures on Flickr. Espera Students made the show at Geneva. After ES-13 Flèche rouge (also showed here at Geneva), here is Sparta, based on a Citroën DS3, with hybrid motor (like React'ev in 2013), agressive new body and an future participation in the 15th Rallye Monte-Carlo Energies Nouvelles. Evoluzione or the evolution theory rewrited in 2011 by Espera students. An atypic machine, between sports-car and bike, with exceptionnal performances. It's not a supercar, but 800 kg only : all is said. Sbarro and Espera are rare in media. So the #206 is an exceptionnal issue of Option Auto, one of the best french car magazines, with six pages about Espera ES-13 Flèche Rouge. A Daimler XJ8 limousine with extende wheelbase et modified front. It's an example of these unknowed Sbarro's creations. More infos here. A Jaguar XK modified by Sbarro for a 26-years old girl, with a stronger engine. A pure hard roadster, perfect for cruizing around Neufchâtel lake. Monza, a sports-car powered by a Suzuki bike engine (at MikadoRacing). Some of the cars aren't very interesting (nobody dreams about kit tuning on old Citroën). Stinger is a track only car, with non hologation possible. The most interesting is the little SuperFive, created by Sbarro himself, typical of his work in the eighties and affordable today. Espera ES-13 Flèche Rouge (Red Arrow) is the last car created by Espera students. Powered by a 156bhp-4 cylinder (from a Citroën DS3), the front of this Le Mans-style sports-car was inspired by plane, with a sort of reactor (see the Turbotraction made by Sbarro in 2004). Espera React'ev, unveiled at the geneva Autoshow in march 2013, take part in the 14e Rallye Monte-Carlo Energies Nouvelles, and prove the serious of the student's work. 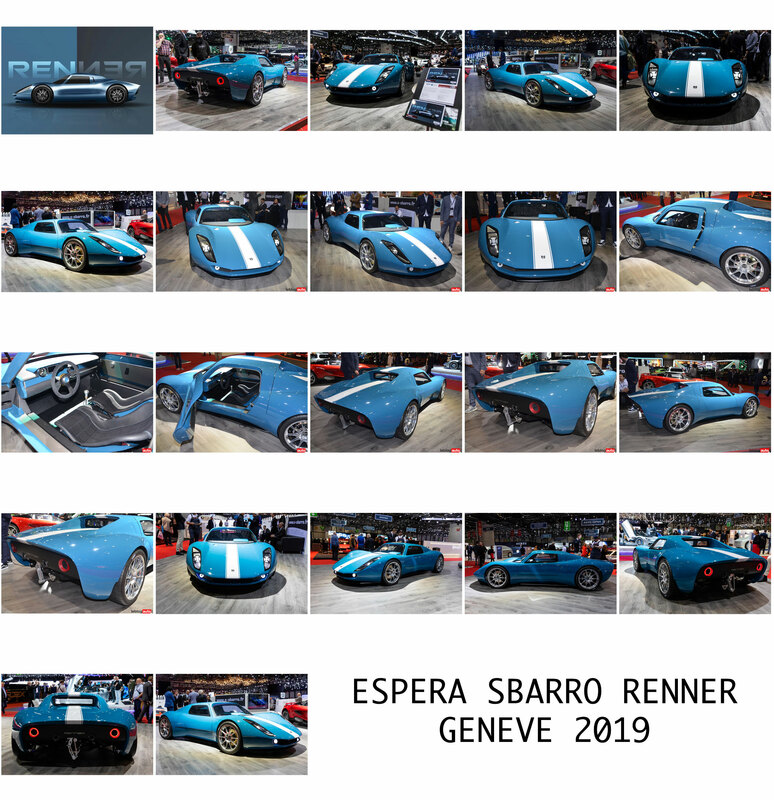 React'ev, first hybrid car made by the Espera school, is a beautiful hybrid sports car and, because of the participation at the Monte-Carlo Rallye, it's one of the most important car in the Sbarro-Espera history. Supercharged 11 or the Lotus Seven recreated by Espera students in 2011 and unveiled at Essen. Powered by a Jaguar engine, this light car represents the pleasure. In white and green, a car to be discovered here : Supercharged 11. This superb hotrod features the latest innovations in embedded technology. Designed and made in​just eight weeks (hence its name, Eight). One of the finest prototypes Espera. All the details here. Sbarro Memory, homage or heresy ? Franco Sbarro unveiled the Memory at Geneva 2012, a pretty evocation of Ferrari GTO et 275 GTB, based on a Ferrari 400. You dream of a Sbarro 328, the famous replica from Franco Sbarro. Few are for sale, but this is the case of this splendid 19836 red one, at Simon Furlonger. For £ 40,000, this is a 328 Speciale, powered by the BMW 6-cylinder 245 hp, with about 15,000 km on the clock. The purpose of this site is not to advertise, but the ads are rare, it can get an idea of the price of a Sbarro. Franco Sbarro and Delphi will unveiled F1for3 (Formula 1 for 3 persons), a show car that showcases a range of innovative products including smart user interface, world-standard mobile TV tuner and a slim line roof module with integrated reception system. Espera students 2011-2012 work hard right now to prepare the prototype to be presented in March at the Geneva Motor Show. It'll be an electric car, named IntenCity. The body takes shape and is apparently in line with Speed'R & Evoluzione. The cockpit will be made by two former students, Honorine Pourcher and Matthieu Noël, creators of Composites 21, a new company based at Meloisey, France : the prototype will be a good way for them to promote their work. Two liters per 100 kilometers, this is what promises Franco Sbarro with Two For 100, a funny car full of ideas to combat car pollution without using expensive technologies or electricity not yet ready. Reduction, downsizing, aerodynamics, that's what provides the Two For 100 presented in Geneva and Essen in 2011. The Spirou's Turbotraction exists ! In 2004, on the occasion of the exhibition Franquin, Franco Sbarro realized the phantasm of every reader of Spirou: making the Turbotraction for real. This car still exists, and even better, it rolls. As proof, the Raphaël Belly's pictures, taken in Monaco during the summer of 2010, found on the page devoted to Turbotraction. April 1968, Franco Sbarro created ACA, Atelier de Construction Automobile. The first model released a few months later: Dominique III, a sports car based on the famous Ford GT40. This exceptionnal prototype will allow Franco Sbarro to meet Eric Broadley, father of the Lola T70; a meeting that will launch his career. Just before a moving, Espera sold five prototypes in early summer 2011. Monza coupe was purchased by an investor who once sold it in the region of Clermont-Ferrand, France. The prototype Katana left for Paris, France. The other three, the Impact, the Gecko and the GT4 concept, were acquired by Francis Bouillet, a former student of the school and founder of the company Kustom & Racer Design. He have the firmly intention to continue with the development of the cars. The Impact will rest, according to his wish, at the Circuit de Dijon-Prenois, France. The Bugatti Royale by Franco Sbarro is an evocation of the famous Bugatti Type 41. Powered by an exclusive 16-cylinder, this luxury sedan back to a time when passion, luxury and exclusivity generated inaccessible chefs-d'oeuvre. The Espera Sbarro school unveiled in june the Supercharged 11, a kind of Lotus Seven, a very light sports car, powered by a Jaguar 6-cyl. The Supercharged did some demonstration laps in Montbéliard, France. We'll see it surely in Geneva in march. Two For 100 is the last Franco Sbarro's concept. After the controversy Autobau in 2010, Franco Sbarro unveiled a sympathetic car, the Two For 100, with the allure of American dream cars of the years 50-60 with its all round cockpit and pleyglass wheels. No more informations for the moment. Evoluzione is the name of the last prototype unveiled at the Geneva Motorshow 2011 by Espera students. Driver in central position, two passengers at the back, engine fully visible, agressive lines, dark gray mat : bike has obvously inspired the students for this Evoluzione. Regularly I am asked how much is a Sbarro. Actually, most often, I don't know. Sbarros for sale are very rare, hence the impossibility of having a reliable rating. But I can tell you today that the one-off Sbarro GT1 is available from The car experience for a whopping € 1 million! A price I find excessive. It remains to verify the seriousness of this announcement. Speed'R was presented at the 2010 Paris Motor Show, on the Orange stand. The students of Espera Montbeliard have managed the feat to bring their car at the best achievements of this show. And yet the Speed'R has no hybrid or electric engine. Worse, Speed'R is powered by an old V6 Alfa Romeo surely very pollutant. But, we love it! And with the crowd that pressed around, we are still likely to believe in the automotive pleasure. You can find more details on the Speed'R on the page devoted to it (here). The latest concept car from the school Espera (Montbeliard, France), Speed'R, will be showed at the Mondial de l'Automobile in Paris in October. Until we know more, here are some pictures from a video taken in June (see video). The Swiss TV website (Television Suisse Romande - TSR) offers free archive. A search on Franco Sbarro provides access to five stories, the oldest date of March 1969. GT40, SV1, the beginning of the Sbarro's school, and reflections on the administrative difficulties Swiss ! In french only. The Sbarro Autobau surprised a lot of people at the 2010 Geneva autoshow. This spectacular orange sports car, powered by a V12 Ferrari, with its unssen design, often criticised, shows that the standardization and marketing have not reached Sbarro. That's a very good news. The Geneva show has always been an important event for Sbarro. Each year brings new models and 2010 has not failed in the rule. The stand accommodates both creations of Franco Sbarro (ACA) and those of students of Espera Montbeliard. Sbarro offers a new model, the Autobau spectacular orange coupe, dedicated to Fredy Lienhard. More surprising to me is the exposure of older models : Sbarro Lola T70, Ford GT40 and Ferrari P4. A bike, or a tricycle, is exposed, with a caddy shopping cart integrated between the two front wheels. Espera Montbeliard has a beautiful sports car, Essenza and a model seen last year, the concept GT4. Ten years this site exists. On February 24, 2000 I put online this crazy project to collect all vehicles built by Franco Sbarro and its students. Nearly 160 today. I did not count the hours spent because it would frighten me. The greatest success of the site is all these contacts with automotive enthusiasts who have written to me, advised me, helped me sometimes. The great difficulty is to obtain reliable information about Franco Sbarro's cars. My pride: being referenced by Fabian Sbarro in his book about his father Franco Sbarro. Sbarro Espera Genesis (2008) and Gecko (2009) will be saled by Bonhams at Rétromobile (Paris) 23rd January, 2010. Estimate: €18,000 - 24,000 for Genesis (lot 275) and estimate: €20,000 - 30,000 for Gecko (lot 276). These two concept cars are running, but are not approved for the road. Only Genesis was sale at €20,700. Espera Montbéliard students presented their two last cars for the year 2009-2010 : two light sports cars powered by a bike engine : the barquetta GT4 and the coupé Monza. For the majority of us, a stock Ferrari 550'll suffice. But some wanted more. Thus Franco Sbarro has designed a "large" 550 . All the informations on this Ferrari built at only two copies. At the Geneva Motor Show 1973, Franco Sbarro presented the SV1, his first car known to the public. There was, however, a second car on the stand: the Tiger, a sports coupe that looks like a Porsche 917. Initially the Tiger was born in prototype form at Bertone in 1967. It was acquired by Robert Jankel, founder of Panther, then reappeared at Sbarro in 1973. Since we do not know much more. Discover the details of this history, as well as rare photos of this mysterious Tiger. Back on cars exhibited at the last Geneva Motor Show. Espera students presented two very different projects: The Gecko, a small recreational vehicle in the minds of buggies and the Impact, a sports model in the line of ESP9 designed for use on circuit. Franco Sbarro, meanwhile, take over the development of his famous orbital wheel. He presented the Orbital hybrid, equipped with 4 orbital wheels. This model was designed with three partners (Delphi, the Fondeurs de France and the Association française de forges) that found in that vehicle an original way to be known (or recognized). The Alcador GTB goes ahead with a new one based on 360 Modena, and LO, based on Testarossa. Finally, in Geneva, there were two vehicles that had the honors at the Mondial de Paris and Essen 2008: the surprising Aero and the beautiful Pendocar.